Forest & Bird says the SPCA’s statement calling for 1080 to be banned shows a naïve failure to understand how nature works in the wild, and they will be seeking a meeting with the organisation to discuss its position. Forest & Bird CE Kevin Hague says “The SPCA’s statement on the use of 1080 is seriously misinformed, and contains errors of both fact and logic. Their position reflects their history of caring for domesticated animals such as cats and dogs, without understanding the needs of New Zealand’s native animals and ecosystems. The SPCA is generally respected for its care of domestic and farm animals. Extending its concern to pests which carry disease, and torture and kill native birds puts its reputation at risk. It’s not hard to get public support for an organisation that promotes the wellbeing of cats, dogs, sheep and cattle. It would be very easy to lose support by giving rats, stoats and possums equal status with native birds. “While the idea of stoats and rats peacefully coexisting with native birds sounds great, the reality is that an estimated 25 million native birds, eggs, and chicks are cruelly eaten alive by introduced predators every year in New Zealand. “This is the terrible death that countless native animals across New Zealand suffer every night. “The SPCA’s position on 1080 is a blow to their credibility. It’s sad to see them promoting flawed logic whose outcome is the extinction through being eaten alive of treasured animals like our kiwi, kereru, and kokako. The SPCA might think all animals are equal but when it comes to conservation, some are more equal than others. Rats, stoats and possums are introduced species which carry diseases that can infect people, farm and domestic animals, and they are not endangered. They prey on native species which are. No-one says 1080 is perfect but experts including the Parliamentary Commissioner for the Environment, the Environmental Protection Authority and the Department of Conservation say it is the best option available to protect native species when trapping and shooting aren’t possible. Attempting to put pests on equal footing with endangered natives is not only denting the SPAC’s credibility, it’s costing it support. SPCA donation cancelled thanks to their stance on 1080 and lack of support for native birds. The Department of Conservation has spent more than $1 million protecting its staff from threats and abuse from anti-1080 protesters but says that doesn’t reflect the full cost of what they’re dealing with. Incidents over the past 18 months include threats to shoot down DOC helicopters and skin the faces off staff. A letter was delivered to DOC’s New Plymouth office with a blue substance leaking out of it, and in the South Island a DOC worker’s details were published online, with comments about filling him with lead, and needing good snipers in New Zealand. The Prime Minister, Conservation Minister and Agriculture Minister have all become targets. Over the past two years DOC has spent around $780,000 on security for aerial 1080 drops. During October and November it spent another $295,000 on a Co-ordinated Incident Management (CIM) plan in response to an increase in threats and abuse, which culminated in an anti-1080 hikoi to Parliament. That CIM involved covering the costs for up to 30 DOC staff to monitor the situation. DOC spokesperson Nic John said they had been working with police to manage the situation – that had resulted in four warnings, four arrests and one conviction so far. “These figures don’t capture the true cost of security to the organisation. Other costs incurred locally have not been captured, as they are very hard to collate nationally.” . . The figures don’t take into account the human cost either. I spent a few weeks in Dunedin this year and while walking the dog I was sitting I came across another dog walker. When I introduced myself he asked me if I was related to someone with the same surname. When I said yes he explained how he knew her and only then mentioned he worked for DoC. I asked if he’d had any problems with the anti-1080 zealots and he said he hadn’t but because of the threats he didn’t usually tell people who he worked for. Forest and Bird’s chief executive Kevin Hague said it was infuriating DOC had had to shift money away from conservation. He said the irrational behaviour of the anti-1080 protesters was highlighted last week when autopsy results revealed a weka, which was used during a protest, had likely been shot with a .22 rifle – despite claims it had died from 1080. “These extremist anti-1080 protesters are just completely beyond reason, they don’t use actual evidence in anything they say and their arguments are immune to the rules of logic that most people would apply,” Mr Hague said. . . I don’t understand people who think the lives and wellbeing of people come second to their cause. They won’t see the irony that diverting money to protect DoC staff from them takes it away from the work needed to protect the endangered species they purport to be fighting for. They are zealots and their immunity to the rules of logic makes countering them both expensive and potentially dangerous. The Department of Conservation (DOC) is fully committed to the use of 1080 to protect our forests and native wildlife in the face of the current campaign of misinformation and is joined by other agencies in standing up for the use of this pesticide. New Zealand’s native wildlife is in crisis. The flocks of native birds that used to fill our forests have been killed and replaced by vast populations of rats, possums, stoats and other introduced predators. This is not the future most New Zealanders want. These animals also carry diseases which pose a danger to people, pets and farm animals. DOC, OSPRI (TBfree NZ), Federated Farmers, Forest & Bird and WWF-NZ all agree that 1080 is an effective, safe and valuable tool in the fight to protect New Zealand’s forests and native birds, bats, insects and lizards. The agencies above, along with community groups and volunteers, invest huge amounts of time and effort to protect out native taonga from predation. There are multiple tools and technologies used to control predators of which 1080 is one. 1080 is a highly effective toxin and a necessary tool to help protect our native species. We use a range of methods including the latest self-setting traps and there is significant research being undertaken into pest control technologies. However, Forest and Bird volunteer trappers agree they could never cover the vast and inaccessible areas that aerial 1080 operations can. Biodegradable aerial 1080 is the most effective tool we have for suppressing rats, possums and stoats in one operation over large, difficult to access wilderness areas—where most of our native wildlife lives. Huge areas of native bush is inaccessible by foot and the only way currently available to kill pests where trapping is impossible is 1080. Scientific and technological advances, including genetic modification, might provide alternatives in the future but there are no viable alternatives now. These organisations use or advocate for 1080 because it is backed by years of rigorous testing, review and research by scientists from Landcare Research, Universities, the Environmental Protection Authority (EPA), Ministry of Health and the independent Parliamentary Commissioner for the Environment. In 2011, the former Parliamentary Commissioner for the Environment, Dr Jan Wright wrote a comprehensive report on 1080 and the current Parliamentary Commissioner, Dr Simon Upton, stands by Dr Wright’s analysis and recommendations. The results are clear that where 1080 is used, our birds and native wildlife start to flourish. We understand that some New Zealanders have genuine concerns and fears about 1080 in relation to the environment, water, animal welfare and wild food sources. We urge them to seek out www.1080thefacts.co.nz that addresses these issues. New Zealanders have a choice: use 1080 to protect our native species over large-scale wilderness areas or end up with collapsing and denuded forests and our native species restricted to pest-free islands and fenced sanctuaries. Predator Free 2050 is an ambitious goal which will need a range of pest control measures to achieve, including some not yet invented or feasible. Until science and technology come up with effective alternatives, the choice is 1080 or death to native birds, bats, insects and lizards, and the destruction of native fauna. A first for the South Island, farmers will have the future in front of them at Progressive Ag. The Progressive Ag conference, organised by Beef + Lamb New Zealand (BLNZ), is being held in Gore next month, on August 9. Organiser and BLNZ southern South Island extension manager Olivia Ross said the idea came from a similar event in the North Island. ”They have an ag innovation and we ran a mini all together in one place here in Gore last year,” she said. . .
A New Zealand-first development is taking shape at Clyde Orchards — a shed with a retractable roof will house three hectares of cherries. Owners Kevin and Raymond Paulin, who could not yet confirm how much the development would cost, will plant thousands of cherry trees in the shed, boosting the company’s overall crop to 30ha. They have been working on the project over winter, with the aim of getting it ready for planting so produce will be available in three years’ time. . . Climate change and water quality are two issues the sheep and beef industry has yet to nail, says Beef + Lamb NZ chairman, Andrew Morrison. Speaking to Rural News last week at the Red Meat Sector conference in Napier, he said health and safety was a big issue 12-18 months ago but the industry has moved on from this and is working through these other issues. “We really want to get the water quality and climate change issues sorted,” Morrison says. “We are working out what tools we can set up to help change the behaviour of people on these issues; not regulation so much as how we can structure policy that gets the necessary outcomes.” . . The heads of New Zealand’s largest conservation organisation and largest farming group have agreed to work together to promote best environmental practice in New Zealand’s farming sector. Forest & Bird and Pāmu have agreed in a Memorandum of Understanding to work together on researching, implementing, and promoting agricultural practices that protect the natural environment. “Forest & Bird is New Zealand’s largest independent conservation organisation, and Pāmu is New Zealand’s largest farmer. It makes sense for these two influential organisations to collaborate on one of the country’s biggest challenges – how to reverse the crisis facing New Zealand’s unique natural environment,” says Forest & Bird Chief Executive Kevin Hague. . .
Apiculture New Zealand (ApiNZ) recently launched a new youth scholarship in beekeeping aimed at encouraging young New Zealanders who wish to take up a career in the industry and undertake training that supports best practice beekeeping. The Ron Mossop Youth Scholarship in Beekeeping is sponsored by Mossop’s Honey based in Tauranga. Ron Mossop was a leading pioneer in the industry, starting out his family beekeeping business in the 1940s and building a values-based family business focused on quality and integrity. Today, the Mossop family honours those values through the scholarship fund which will be awarded annually. . .
Plant-based proteins won’t replace meat as consumers want both, a food scientist says. Red meat consumption in New Zealand has fallen 57 percent in the last decade and companies like Air New Zealand have started offering meat free burger patties. But Plant and Food Research scientist Dr Jocelyn Eason told RNZ’s Sunday Morning that did not mean New Zealanders wanted to replace meat with lab-grown meat. She said consumers were increasingly becoming “flexitarian” – choosing to be vegetarian sometimes and eat meat other times. . .
A new partnership between Cardrona Alpine Resort and Queenstown businessman John Darby will lead to the development of New Zealand’s largest alpine resort, incorporating Cardrona and a new Soho Basin Ski Area. Soho Basin faces Queenstown and covers all the southern and south-west faces of Mt Cardrona, and includes the two Willow Basins that directly adjoins Cardrona Alpine Resort’s southern boundary. Soho Basin will add an additional 500ha of high altitude skiable terrain, offering up to 500 vertical metres of skiing. . . .
• Net rural confidence has jumped up in the second rural confidence survey of 2017 and is now at the highest level recorded since the survey commenced in early 2003. • Farmers across all agricultural sectors were more positive about the outlook for the agricultural economy with the majority citing improved commodity prices as a key reason for increased optimism. • The number of farmers expecting their own business performance to improve was also up in comparison with the last survey with over half of farmers expecting an improvement in the coming 12 months. . .
Cannabis is still the most common drug ”by a country mile” found when staff are tested, farmers attending a workshop in Ashburton last week heard. Therese Gibbens, general manager of the Canterbury West Coast area for The Drug Detection Agency, said 80% of positive drug results from tests carried out by the company in Canterbury detected cannabis. This was followed by opiates, amphetamines and methamphetamine. She had tips for farmers about policies, detection and managing the risks of staff affected by drugs or alcohol, backed up by statistics and experience. . .
Trade Minister Todd McClay says he believes the time is right to launch trade talks with Mexico, Chile, Peru and Colombia as part of the Government’s push for better access in Latin America. Mr McClay leaves tomorrow to attend the Pacific Alliance Leaders Summit where a trade deal will be top of his agenda. “We’ve been talking to the four Pacific Alliance countries about better access for Kiwi exporters for the last two years. With direct flights to South America there is increasing opportunity for New Zealanders to do more in these growing markets,” Mr McClay says. . . Associate Minister of Transport Tim Macindoe welcomes a new high tech warning system, which will help to improve road safety, has been installed on State Highway 1 in the Waitaki District. The new Rural Intersection Active Warning System at the turnoff to Moeraki Boulders, off State Highway 1, is now operational and the variable speed limit is now legally enforceable. “The new warning system is able to detect vehicles approaching the right turning bay at Moeraki Boulders Road and vehicles waiting to turn back on to the highway, and automatically adjusts the speed limit in the area to 70km/h to allow the approaching car to merge safely with oncoming traffic,” says Mr Macindoe. The 70km/h variable speed limit will apply 170 metres either side of the SH1/Moeraki Boulders Road. 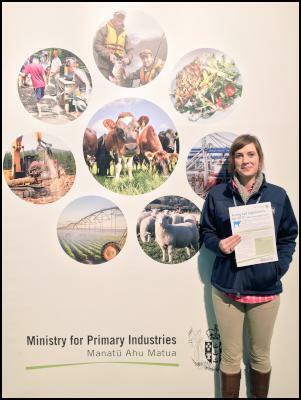 . .
MPI’s Penny Timmer-Arends has attended many field days and workshops to discuss the new bobby calf regulations with those affected across the supply chain. The Ministry for Primary Industries is asking farmers to be ready for new bobby calf regulations coming in this season. “The new requirements for bobby calf shelter and loading come in to play on 1 August and we want to make sure everyone is well aware and prepared,” says Paul Dansted, MPI’s Director Animal and Animal Products. “Calves need to be provided with shelter that keeps them warm and dry, and loading facilities that allow them to walk onto trucks.” . .
New Zealand’s largest poultry producer, Tegel Group Holdings Limited , today reported its FY2017 results for the 53 weeks ended 30 April 2017. The Company reported Net Profit After Tax (NPAT) of $34.2 million. This was $22.9 million higher than the prior year mainly as a result of a change in capital structure following listing. Underlying EBITDA was $75.6 million, 0.8% ahead of FY2016. Both NPAT and underlying EBITDA were within the Company’s revised guidance range issued in December 2016. . .
Forest & Bird has awarded the outgoing Parliamentary Commissioner for the Environment an ‘Old Blue’ for her significant contribution to New Zealand’s environment and wildlife. “Over ten years, Dr Jan Wright’s insightful reports have illuminated complex environmental subjects and in many cases fundamentally improved public appreciation of those issues,” says Forest & Bird Chief Executive Kevin Hague. . .
More than half of Kiwis say they are eating less meat, and a quarter expect to be mostly meat-free by 2025, as they focus on their health and budget according to the results of a new survey. It seems the days of a nightly meal of meat and two veg may soon be behind us too, with one in five of those surveyed (21%) saying they choose to have a meat-free dinner for more than half of the week. . . The Government has announced a target of 90 per cent of New Zealand’s lakes and rivers meeting swimmable water quality standards by 2040, alongside releasing new policy, regulations, information maps and funding to help achieve the new goal. “This ambitious plan to improve the water quality in our lakes and rivers recognises that New Zealanders expect to be able to take a dip in their local river or lake without getting a nasty bug,” Environment Minister Dr Nick Smith says. “The plan is backed up by national regulations requiring stock to be fenced out of waterways, new national policy requirements on regional councils to strengthen their plan rules on issues such as sewage discharges and planting riparian margins, a new Freshwater Improvement Fund and new maps that clearly identify where improvements are needed. The target covers the length of rivers over 0.4m deep and the perimeters of lakes greater than 1.5km, which total 54,000km. The plan is about improving the frequency that we can swim in our lakes and rivers, noting that even our cleanest rivers breach swimming water quality standards during storms. This is a very important point – nature is sometimes to blame for lower quality. The swimmable target is based on meeting the water quality standard at least 80 per cent of the time, in line with European and US definitions. Currently 72 per cent by length meet this definition, and the target is to increase that to 90 per cent by 2040. This means an additional 10,000km of swimmable rivers and lakes by 2040, or 400km per year. “The maps I am releasing today provide the most comprehensive and consistent information on water quality for swimming of New Zealand’s rivers and lakes ever published. These will help focus councils and communities on improving their local water quality, as well as help people make decisions about where they can safely swim. The maps are connected to the Land, Air, Water Aotearoa website that provides real-time information on water quality, which is particularly relevant for the fair and intermittent categories. “The challenge of improving water quality varies significantly across New Zealand. This plan requires improvements in water quality across all regions and all categories. The target not only requires an improvement in areas that are swimmable, ie into the fair category, but also rivers and lakes being moved from fair to good, and good to excellent. Regional targets to achieve the national goals are to be worked through with regional councils by March 2018. Some regional targets will need to be greater than the 90 per cent and others, where it is more difficult to achieve, will be less. strengthening the requirement for monitoring and improving quality. “The new regulations on excluding stock from waterways are an important part of this plan to improve water quality. The rules progressively apply to dairy, pig, dairy support, beef and deer farms from this year to 2030 relative to the steepness of the country, at an expected cost of $367 million,” Dr Smith says. “We are today opening bids for the new $100m Freshwater Improvement Fund and announcing the eligibility and assessment criteria, which closes on 13 April. This comes on top of the $350m already committed by the government, of which more than $140m has been spent on specific river and lake clean-ups. The detail of the NPS and Stock Exclusion Regulations are open for consultation until 28 April 2017. Deterioration in most waterways has taken place over many years and can’t be reversed quickly. New freshwater reforms will result in 56,000 km more fences protecting New Zealand waterways from stock – enough to go round the world one and a half times, says Primary Industries Minister Nathan Guy. The new rules on stock exclusion are part of the Government’s plans announced today setting a target for 90% of rivers and lakes to be swimmable by 2040. “Farmers have made huge progress in recent years to improve their environmental practices and this will be another important step forward. Dairy farmers have already voluntarily fenced off over 24,000km of waterways,” says Mr Guy. “We know that stock standing in or regularly crossing waterways can do significant damage. While dairy farmers have voluntarily fenced off around 96% of their waterways, we want to extend this to other types of farms as well. “The proposed national regulation would ensure that dairy cattle, beef cattle, pigs and deer are kept out of waterways. “We need to ensure the changes are practical for farmers, so the exclusions would be implemented in a staged process starting this year through to 2030, depending on the stock type and land slope. “There are long term benefits for the primary industries and wider economy from these reforms. Overseas markets and consumers increasingly demand a strong environmental performance over and above regulatory requirements. In this context, protecting New Zealand’s natural advantage has never been more important. “No single organisation or group is solely responsible for improving our water quality. Meeting the target will take a collective effort, but the primary industries have a key contribution to make. “In the meantime, the Ministry for Primary Industries continues to work with the primary sectors to invest in good ideas which promote environmental best practice. One example is the Farm Systems Change program, which identifies high preforming farms and uses farmers’ networks to spread their knowledge. “Another is a major programme under the Primary Growth Partnership, called Transforming the Dairy Value Chain. Under this programme effluent management systems have been improved, and every region now has a riparian planting guideline developed in conjunction with regional councils. “As a Government we are committed to growing the primary industries at the same time as improving water quality. Water storage schemes like Central Plains Water and the Waimea Community Dam help in this by taking pressure off groundwater sources and maintaining summer river flows, delivering both economic and environmental benefits. “We also know that science will play a major role in improving our freshwater. The ‘Our Land and Water’ National Science Challenge is investing $96.9 million over 10 years into this, hosted by AgResearch and involving six other Crown research institutes. “Achievable outcomes within a reasonable timeframe” is how IrrigationNZ CEO, Andrew Curtis, described today’s release of the government’s ‘Clean Water’ document. He hoped however that the target of 90% of rivers and lakes being swimmable by 2040 didn’t let urban waterways ‘off the hook’. “Farmers have received the lion’s share of blame for New Zealand’s water quality degradation and despite evidence backing up the contribution cities and industries make to poor water quality, they have largely escaped the finger-pointing. I’m hoping the Government will call every New Zealander to account for water quality, recognising we all contribute to the problem, therefore we must all work together to enact the solution” said Curtis. Poor water quality is not only a rural problem nor is it solely due to bad farming practices. IrrigationNZ was pleased the Government had recognised the important economic contribution farmers make to our communities, stating that Regional Councils must consider the economic wellbeing of their community when making decisions about water allocation. “Farmers and growers make significant investments in irrigation infrastructure and on-farm efficiencies, and the return on that investment is spent in towns and cities throughout New Zealand. We all benefit from irrigation and it’s important councils don’t impose restrictions that negatively impact the viability of our primary sector.” . .
“The new stock exclusion requirements for dairy cattle is a strong endorsement of the hard work dairy farmers have done on their farms to protect waterways,” says DairyNZ CEO Tim Mackle. “The on-farm fencing requirements in the new rules have already been met by 97.1 percent of dairy farmers around the country, and the target by May, a month ahead of the new requirements, is to be 100 percent, with all waterways running through dairy farms will be fenced off and all stock crossings bridged,” he says. Dr Mackle says fencing – currently 27,109 kms – is always set back a healthy distance from waterways, varying from farm to farm depending on the soil type and contour of the land. “There’s still a way to go in some areas, and dairy farmers are well aware of that. We acknowledge that improving New Zealand waterways is a long journey, as today’s announcement recognises. The good news is dairy farmers around the country are leading the way in protecting freshwater on their farms. “Our dairy farmers can be immensely proud of the work they are undertaking for the environment on their farms, and many are also doing work to improve their surrounding communities – and all New Zealanders, whether they are living in towns and cities, or in rural communities, can also be proud of the efforts of our dairy farmers,” says Dr Mackle. As part of their commitment to the environment, dairy farmers are also planting vegetation along waterways, and using native plants such as manuka, cabbage trees and flaxes, as well as native grasses, that have superior ability to filter and slow run-off, he says. “Added to this, all dairy farms now have dedicated effluent management systems with effluent ponds, just like towns around the country. Areas such as the dairy shed and yards drain directly into these systems where the effluent is stored and later used by farmers to fertilise their land. Over the past three years farmers have invested over $1 billion dollars in environmental protection measures, he says. Dr Mackle says while a number of forward-thinking farmers began environmental initiatives a decade and more ago, the actions of the past three years are recorded in the Sustainable Dairying Water Accord. Full results of year three of the water accord are currently being audited and will be announced in April. “Water is, of course, the lifeblood of horticulture and our commercial growers have been innovating for some time with environmentally sustainable ways of growing healthy, fresh food for all New Zealanders,” Mr Chapman says. “Growers implement a number of techniques to protect waterways near their properties. These including riparian planting and management adjacent to waterways and silt traps to collect run-off caused by rain and stop anything entering nearby waterways. “Riparian planting has many benefits, particularly to water quality, but it is also very expensive and growers bear the cost of that. “It is great to see the Government opening applications for the $100 million Freshwater Improvement Fund, and we will certainly be looking at projects that could be part of that to create more and better ways to protect waterways near growing land. “The announcement is generally consistent with some of the Land and Water Forum’s recommendations,” said EDS CEO Gary Taylor. “For the first time, swimmability is the objective in freshwater management. “We will have transparency regarding which lakes and rivers are in fact swimmable and which are not. This will vary across seasons and places. Regional councils will need to improve degraded systems with a target of achieving 90% swimmability by 2040. “The standard for what constitutes swimmable rivers and lakes is comparable with the EU Water Framework Directive. Whether the target date is acceptable will become clear during the consultation phase to follow. “Other recommendations by the Land and Water Forum have been accepted by Government. These include providing greater rigour on nitrate levels and on macroinvertebrates in the National Policy Statement on Freshwater Management. However, some of the detail on these issues appears to raise questions that need further exploration. “One important issue that hasn’t been adequately addressed is turbidity and sediment – water clarity. The Forum is doing more work on this later in the year. . .
Forest & Bird has condemned the government’s new water quality standards, warning New Zealanders that they lock in current levels of water pollution and allow for a 5-fold increase in the chance of getting sick from swimming in a river. “Despite an explicit assurance from Minister Smith that the new water standards would provide for human and ecosystem health, he has failed to deliver on either of these things,” says Forest & Bird CEO Kevin Hague. Contrary to the overwhelming public concern for the state of New Zealand’s rivers and lakes, the government’s announcement today does not require any improvement to our water quality, except for the very worst rivers. “If your local river is polluted now, the government does not require that its water quality is improved to a standard that is safe for people and the ecosystem that it should support. Instead, all they propose is that the current situation is maintained,” says Mr Hague. . .
What would he and his organisation do when nature causes the problems?. The Otago Regional Council had concerns about only three waterways in January, two alerts were due to high rainfall and the poor water quality in the Kakanui River was caused by birds? Clean water is one of the measures of sustainability, maintaining clean waterways and improving those with poor quality is a long-term and expensive process but the goal of 90% swimmable is achievable.
. . . Green Party health spokesman Kevin Hague said he would get rid of private healthcare altogether. “I think that distorts the health sector completely and produces a two-tier system.” . . . This not only shows the Green’s red roots, it also shows a woeful understanding of how the health sector works. Medical specialists usually work in both public and private hospitals. The work they do in private hospitals, paid for by individuals or insurance companies, takes pressure off public services. ACC also uses private specialists to get people back to work sooner than if they had to go on public waiting lists. But private healthcare isn’t just medical specialists in private hospitals. It’s general practitioners, dentists, orthodontists, optometrists, physiotherapists, radiologists, laboratories . . . Does Hague really think all these services should be publicly owned and funded? The Memorandum of Understanding between Labour and the Green Party included a no surprises clause. Last week Metiria Turei announced the desire to slash the value of houses by 50%. This week Hague is planning to socialise all health services. I suspect both came as a surprise to their would-be coalition partner.